Your website is the most easily accessible resource for potential clients and customers. 37 Northwest can help get you the best revenue stream you never knew you had. 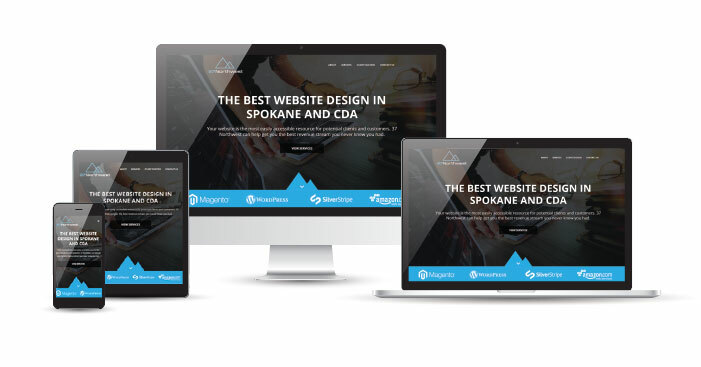 Here at 37 Northwest we utilize modern website design practices to bring to life both a captivating and fully functional website built to your Spokane or Coeur d'Alene business's needs. With the ever-changing nature of today's world, having a website built for the future with your best interests in mind is the best standard operating procedure in any industry, and it is also the easily accessable face of your company to your customers and potential clients. 37 Northwest combines the talents of Search Engine Optimization, Search Engine Marketing, and User Experience with Full-Stack Development to produce a website your competitors will envy. When all of these processes are applied upon developement, the result is a remarkable website that doesn't just look breathtaking, it also lures in new users that become loyal customers. Great web design isn't just about the looks of a website. Web Design is about the entire feel a user gets when visiting. 37 Northwest takes care of it all ensuring the end result is a masterpiece. Customers tend to research before a purchase. In today's age most research is done online, and with a powerful SEO foundation 37 northwest can help you rise to the top of those Google searches. Branding efforts say a lot about who you are as a company. From the typography to the brand colors, 37 Northwest can help you send the right message. What good is your website if it goes down? 37 Northwest guarantees 99.99% uptime with 24/7 support, 365 days a year. Don't leave one of your highest ROI's to chance. At 37 Northwest, we know you worked hard to get your business to where it is today. You don't cut corners on your products or services, and your website should be a representation of that. Each website completed by 37 Northwest undergoes rigorous testing to ensure your customers and clients have everything they need at their fingertips. In today's age, your website is the face & handshake of your company. First impressions matter, make yours exceed with the 37 Standard. Captivating Design By utilizing modern design elements, we ensure that your website will captivate your audience creating an unforgettable first impression to help create a loyal customer for life. Reactive Layouts With the rise in mobile web browsing, it is becoming a necessity to establish a responsive design. We check thoroughly to make sure your site is perfect upon delivery. Optimized for Google By leveraging our knowledge of Google and how it works, we are able to optimize websites to bring in free traffic that converts. A strong SEO foundation will keep a business busy for a lifetime. Enhanced User Experience Every website needs user experience at the forefront of design. By focusing on customer interactions, conversions come naturally and so do loyal customers. Easy to Self Manage Whether it's a new product release or site content, 37 Northwest will design your website to be easily managed for any future additions your company may need. Results that Boost ROI Websites are today's most powerful form of marketing. By utilizing the best of established behaviors, 37 Northwest will create your site to not only drive traffic, but convert it too.